Read It Forward is a community-wide reading program designed to encourage reading throughout the City of Birmingham. The concept is based on the book Pay it Forward by Catherine Ryan Hyde. It is a story about an eighth grader who decides to change the world by doing a good deed for someone and then asks that person to “pay it forward” by doing the same for others. For the 2009 Read It Forward, the Birmingham Public Library has partnered with the Birmingham Jewish Federation and the City of Birmingham. Where did you find this book? Did you pass it on, and where? How would you rate this book? Great - Really liked the story!! Good - Liked the story! Yuck!! - I really disliked the story! The story was so boring I didn't even finish it!! Thank you for participating in our "Read It Forward" program! Log onto the read it forward web site often to track your book as it travels from reader to reader. See what others have to say about this book. 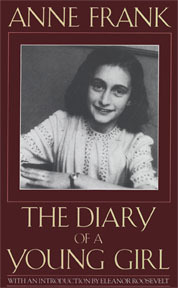 For more information on Anne Frank, including a virtual tour of her hiding place, information about her life, and her online museum, visit www.annefrank.org. Read It Forward is brought to you by Birmingham Public Library.